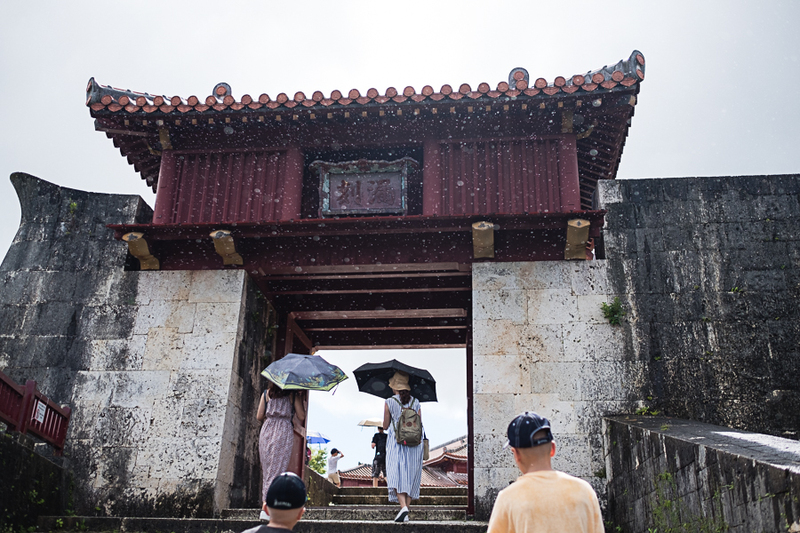 On the first day of September, we braved the humidity and drove south to visit Shuri Castle - a World Heritage Site and once center of power for the Ryukyu kingdom. 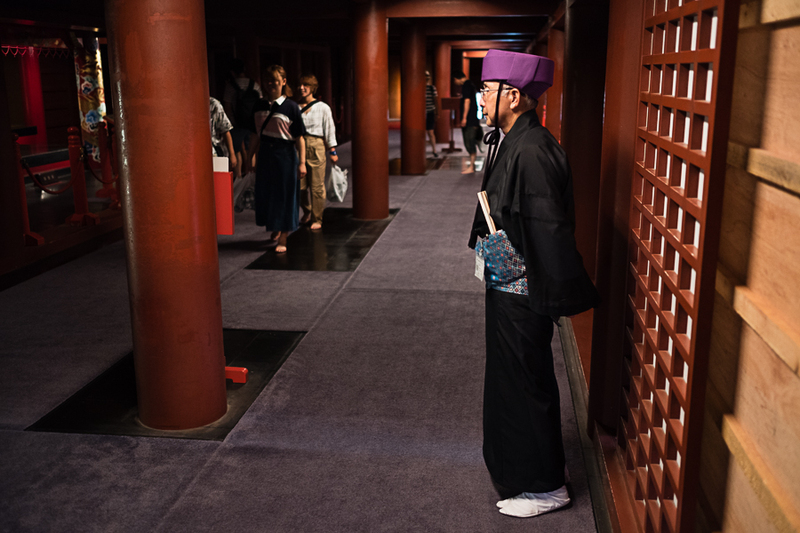 Between the 15th and 19th centuries, this peaceful kingdom of farmers, fishers and traders included all the Pacific chain islands between Japan (Kyushu) and Taiwan. The largest island in this chain is Okinawa, and the Ryukyan government was centralized here in present-day Naha. Earliest buildings on this site dated from the 1300-1500s, but sadly most of these historic treasures were destroyed in the Battle of Okinawa during WWII. After painstaking archeological research, most of the extensive complex has been restored and recreated. 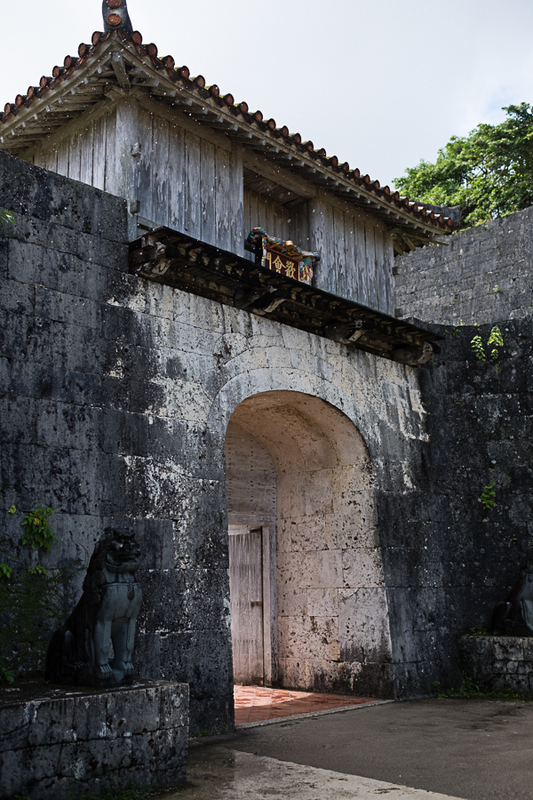 Excavations and study continue, but the castle and surrounding gardens are open for tourists to relive the experience of a Ryukyan aristocrat or Chinese emissary visiting this seat of power. gated entrance to the castle, reconstructed. Excavations continue to the right. The castle is a series of gates and outer courtyards, getting closer and closer to the king, until you reach the inner sanctum where only the highest level of officials and dignitaries were allowed to enter. 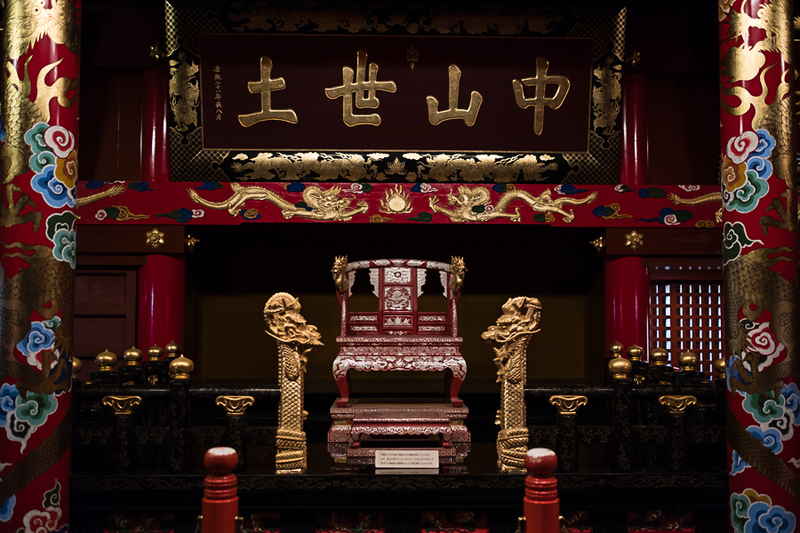 This is an original dragon conduit gifted by the Chinese to the Ryukyan king in 1523. It still provides natural spring water to the castle. 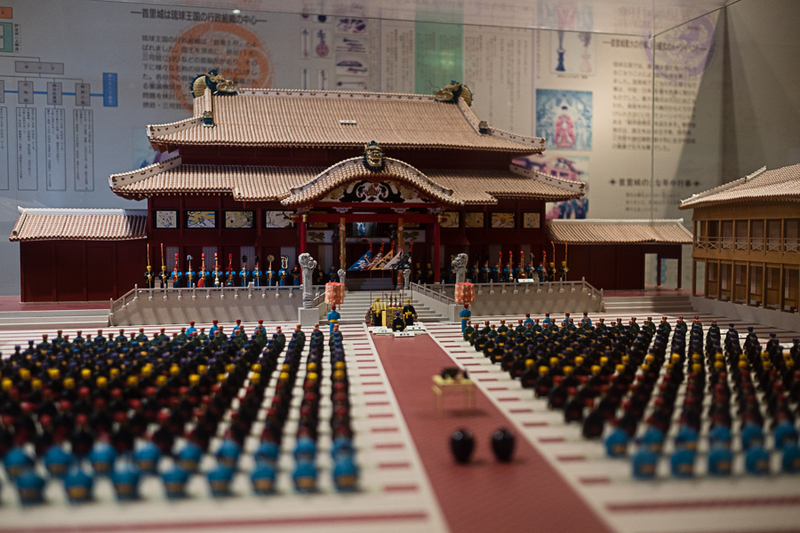 Though Shuri castle has extensive fortifications, the Ryukyu kingdom had some protection as a Chinese tributary and never had a standing army. Lack of a military probably contributed to it's defeat by the Satsuma clan of Japan, which ended its nominal independence. Main building where the king performed his royal duties and greeted emissaries. The entire building is coated with a thick red lacquer that is now being painstakingly stripped and re-applied to protect the wooden structure from mold. The Seiden, or main building, was built and rebuilt and added-on to several times through the almost 5 centuries. This recreation is a replica of what the building would have looked like in the 1400s. It was built almost entirely of wood and had 3 floors. The king and his family lived and worked in and around this building. Gardens and winding walks encircle the central area and once provided ground for stables and storage buildings. 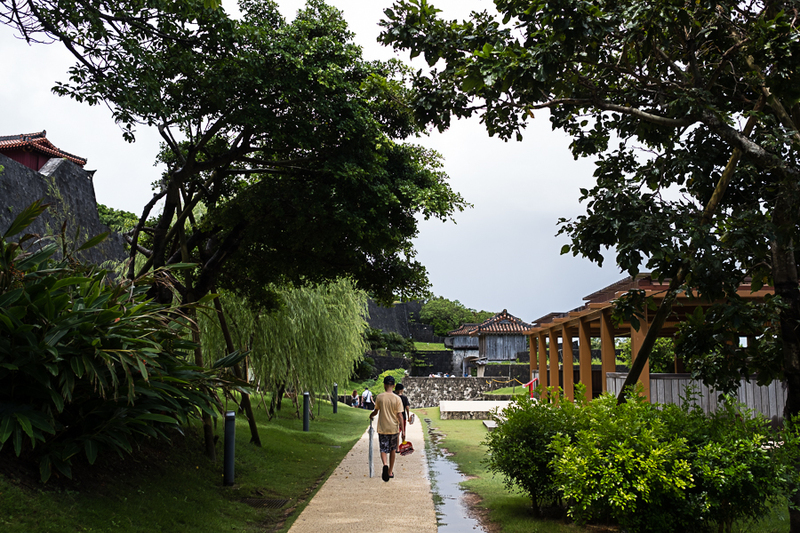 Extending 300m south of Shuri castle is a stone-paved road dating back to the 1500's. It once connected the homes of the aristocrats and officials to the palace. We couldn't imagine these important functionaries walking steeply up to the castle every day in heavy robes and wooden geta (flip-flops), on often-slippery limestone, to pay their respects...until we realised many of them were probably carried up by horses or in chairs. Most of this stone path, with built-in drains, is preserved and still used by locals who live alongside history. You can still walk these lanes and even see a 15th century well for watering the horses. 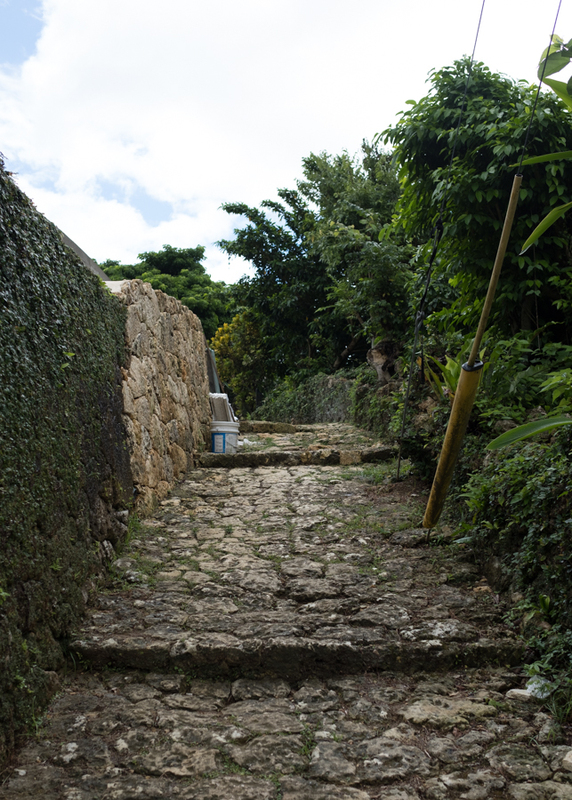 Restaurants and traditional Okinawan homes line this old, uneven limestone path. We stopped at a cafe for some Okinawan fare. Cafe Ishidatami Chaya Madama is a special little secret along the path - the menu offered pork soba, brown sugar pudding, yakisoba, and a cake set. 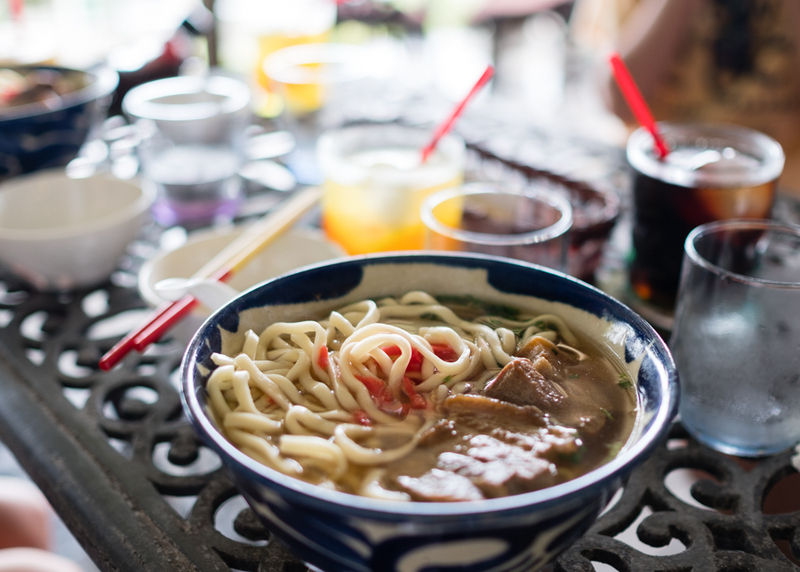 It is pretty impressive to think of all the traditional hot foods that Okinawans would eat in the tropical heat of summer. I can't say the hot broth is refreshing but it sure is tasty! And the ice-cold Shiqwasa juice (Okinawan limes) helped beat the heat.